My T-Fal cookware giveaway began yesterday. 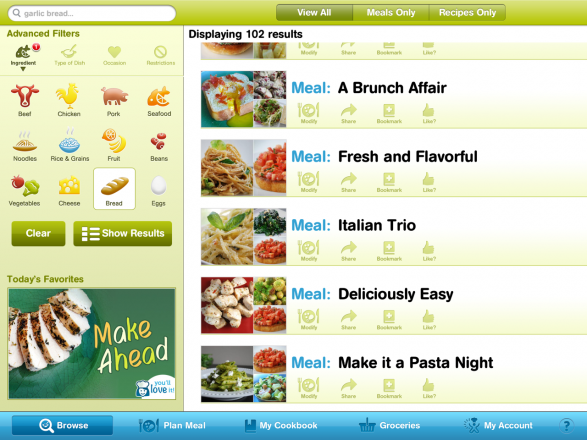 In conjunction with that giveaway, I was asked to review the Cooking Planit app. I joke with my kids that I am “under-app-ed.” That is my made-up term meaning that I hardly have any apps and the ones I have I rarely use! I know…I should get with the program! I have always been a book person, enjoying the feel of the pages in my hand. I still use a paper calendar. So, I was pleasantly surprised how much fun I had scanning through the variety of recipes on my iPad screen. It was so easy to quickly peruse the offerings, and I determined right away that I would have no problem choosing a recipe my family would enjoy. Cooking Planit caters to the cook who just needs to get dinner on the table and didn’t have time to get to the store as well as the cook that wants to make the process a creative endeavor. On this app, you may search according to what you are hungry for or by the ingredients you happen to have on hand. You may include dietary restrictions and special occasions in your search. The app also allows you to choose the desired number of servings and, when cooking a complete meal, tells you when to start the various steps so that the main course and sides are all done at the same time. On the right side of the page, you will find Helpful Hints and Prep and Cook Tips. This app was truly designed to make cooking both pleasurable and delicious. In the browse section, you can scan through featured meals/recipes or search for something specific. The advanced filters allows you to refine your results by categories. This is especially helpful if you are looking for recipes using a specific ingredient or for a particular occasion. The salmon recipe I chose had recommendations for the following sides and provided helpful, at-a-glance information on time required and skill level. Two, four, or six servings may be selected for any recipe chosen. Notice the picture from the app, below, looks almost identical to the photos I took. Place the chopped chives in a medium mixing bowl. Dry the salmon fillets thoroughly. Season with salt and pepper. Place the potatoes in the bowl with the chives. Add the mayonnaise, season with salt and pepper, and stir to combine. Scoop the potato mixture in equal portions over of each salmon fillet. Press it into the fish so that it is evenly distributed. Heat a large sauté pan over medium heat. Add the olive oil and warm. 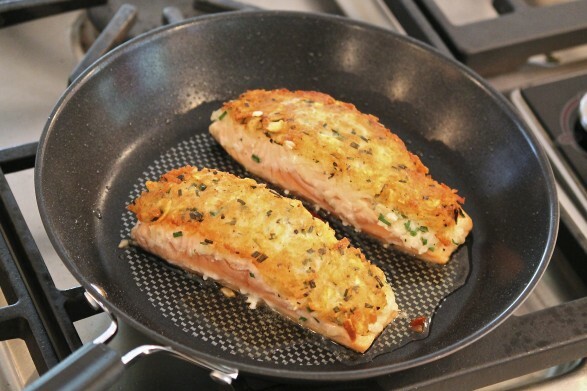 Once the oil is hot, carefully add the salmon fillets to the pan, placing the potato side down. Gently press down on the fillets to help the potato mixture adhere to the fish. Sear the salmon until you can see that the potatoes are turning golden brown, about 3-5 minutes. Using a fish spatula or other big spatula, gently flip the fillets and cook until the sides look cooked through (or to your prefer degree of doneness), another 3-5 minutes. 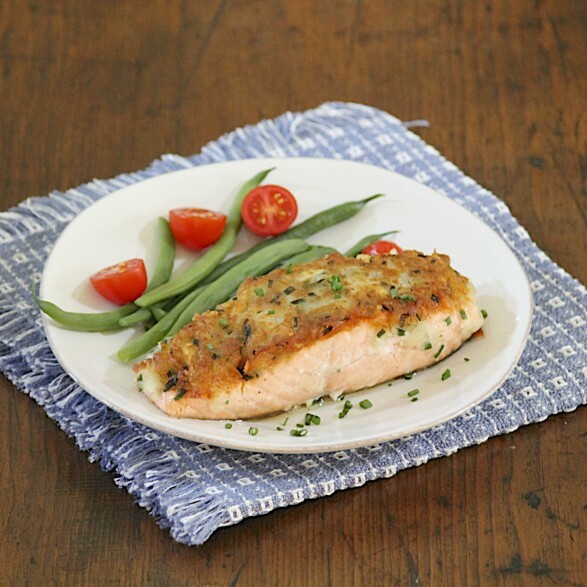 Transfer the potato-crusted salmon to a serving platter or dinner plates, and enjoy! The T-fal pots have stainless steel bases that evenly distribute heat. The pans include a patented non-stick interior and Thermo-­‐spot™ technology. This is viewed as a red dot in the center of the pan (currently under the salmon) that indicates when the pans are perfectly preheated by changing the patterned spot to solid red. There are also convenient measurement lines inside the pots and the set is dishwasher safe. While it wasn’t applicable in this recipe, all T-fal pieces are oven-safe to 450 degrees F.
(Giveaway has ended) In order to enter this giveaway, you’ll need to create a free account either at the Cooking Planit website or download the free version of the iphone/ipad app. Click HERE to enter. All you have to do is leave a comment! Once you’ve done that, you are ready to go! And check out the following pages that are still participating in this giveaway. You may enter once at each location. Fine Print & Disclosure: Open to US Citizens only. Limit one winner per household. If you win multiple contests, you will receive only one set of cookware and an alternate winner will be chosen to receive your other set. I have received a set of cookware that I have agreed to review for T-Fal and agreed to promote CookingPlanit.com. The reviews are my own and are uninfluenced by either company. 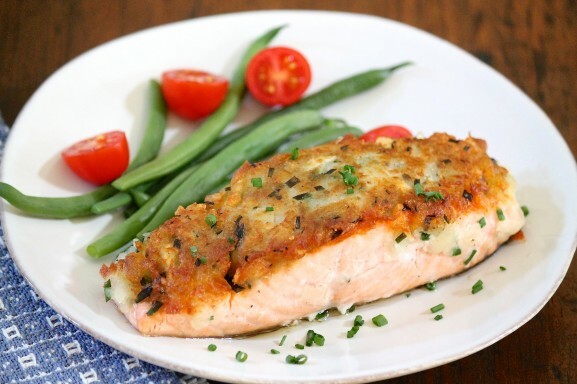 Thank you for sharing your Potato Crusted Salmon recipe with Welcome Home, which has now introduced me to your FB page! Look forward to trying this salmon recipe and others in the future! Thank you for the kind comment, Gayle. I hope you enjoy this recipe and a few others! I am not a salmon lover, but know it is good for me–I will try it this way! I hope this topping makes the salmon taste better to you, Linda! I would love to know how you make out! Thank YOU, Cindy. I was happy to share the link! So good to “see” you, Terra! Thanks for the comment, and I hope you are well! Yum this sounds delicious! I was just about to go pick up some salmon and you have so many great recipes for it I want to try them all! Thank you for the nice comment, Carolyn. There are quite a few salmon recipes on this site we really enjoy…and more to come! Hope you enjoy as well!